Chestnuts are roasting; hot cider is filling the house with allspice, cloves, and cinnamon; gingerbread cookies are turning golden in the oven; and the merry scribes of the Fellowship of Fantasy are ringing in the season with Santa Dragon’s Holiday Extravaganza, 24 days, 24 prizes, and oodles of fun! Each day, enter a new contest and meet a new author. The contest runs December 1st to December 24th. Go the Fellowship of Fantasy Facebook Page to find your stop of the day. Like it if you haven’t already done so! If you’ve already signed up for my Newsletter, follow me on Twitter and leave your handle in the same comment above. If you already follow me on Twitter then you’re a loyal fan, but leave your handle in the comment section anyway. If you win, I’ll need your email, so DM now your email via this Facebook page. The winner will be selected December 26th. That’s it! Good luck, and let’s talk FANTASY FICTION! 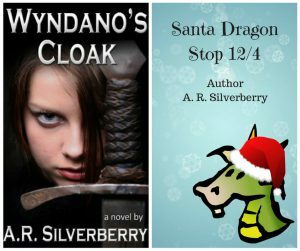 This entry was written by A. R. Silverberry, posted on December 4, 2016 at 2:04 am, filed under Author Events, CONTEST, Uncategorized and tagged A. R. Silverberry, Contest, Fellowship of Fantasy, Prize, Santa Dragon Holiday Extravaganza, The Stream, Wyndano's Cloak. Bookmark the permalink. Follow any comments here with the RSS feed for this post. Post a comment or leave a trackback: Trackback URL.